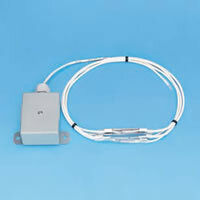 TE-707 flexible averaging temperature sensors offer many benefits over rigid tubular sensors. Rigid sensors have to be uncoiled and then bent into position using a tube bender. If kinked, moisture will enter, condense and cause intermittent shorts. Flexible sensors are easy to install and are moisture sealed. Just clip or tie directly to the heat exchanger, coil or duct. Unlike tube averaging sensors, the sensing nodes in flexible cable are clearly identified and can be positioned to correctly average the temperature across the face of the coil or duct. The sensing elements in rigid tubular averaging sensors are not in contact with the tube and may have an air gap resulting in slow response time. The sensing nodes in flexible averaging sensors have a thin protective sheath directly in contact to the sensing element resulting in an extremely fast response time thus eliminating false freeze stat trips. 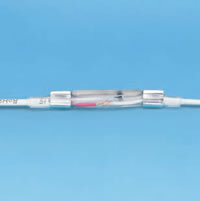 The TE-707 Plenum Cable averaging temperature sensor incorporates four equally spaced sensor modules interconnected with a UL listed CL3P plenum rated cable. The sensor nodes are moisture sealed with epoxy encapsulation and protected by a polyolefin sheath to provide a rugged and reliable assembly. Sensor modules are mechanically protected against flex and physical abuse with an aluminum clip which is crimped across the module to form a bridge to stress relieve the assembly. The averaging temp sensor incorporates four even spaced sensor modules over 6, 12 or 24 ft / 1.8, 3.6, or 7.2 meter lengths to handle any size duct or plenum. Available with polycarb, galvanized steel or NEMA-4/IP-65 powder coated steel enclosure to cover all applications. The TE-707 Armored Cable averaging temperature sensors incorporate the same plenum cable sensors except the assembly is protected with a woven metallic sheath to enhance ruggedness and to improve thermal conductivity across the four sensing modules. 384 monolithic 32 gauge tin plated copper fibers are woven into a continuous metallic sheath over the plenum rated, moisture sealed, averaging cable temperature sensor. 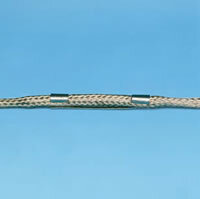 The metallic woven sheath is secured to the cable sensor ends and all installation and operational stress or pull force is absorbed by the 384 copper fibers resulting in a very rugged flexible sensor. Tin plated copper fibers provide excellent thermal conductivity across the length of the flexible sensor and bridging clips across the sensing modules support the assembly against flex and mechanical abuse. 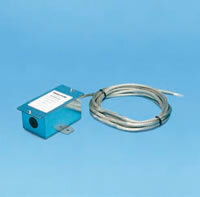 The averaging temp sensor incorporates four even spaced sensor modules over 6, 12 or 24 ft / 1.8, 3.6, or 7.2 meter lengths.